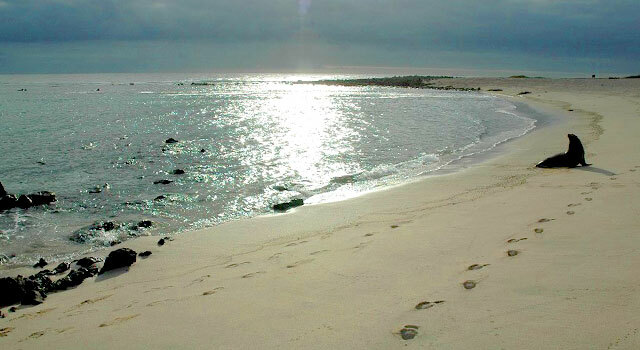 The beautiful and versatile San Cristobal Island is one of the most eastern and oldest of the Galapagos Islands. It is moderately-sized, at 195 square miles. But, that land area is filled with some of the most visited and remarkable sites anywhere in the world. This versatility also accounts for the fact that San Cristobal is the second most populated of the Islands; about 8000 people live on San Cristobal. While all of the Galapagos Islands is dedicated to conservancy and maintaining the tenuous ecological balance discovered by Charles Darwin, nowhere is this more true than the Island of San Cristobal itself. It is a forerunner in the quest for renewable energy; at least 60 percent of its energy already is generated by wind and solar power. You will see the wind towers from the harbor and as you drive throughout the island. The primary port of San Cristobal is the very busy harbor at Puerto Baquerizo Moreno. 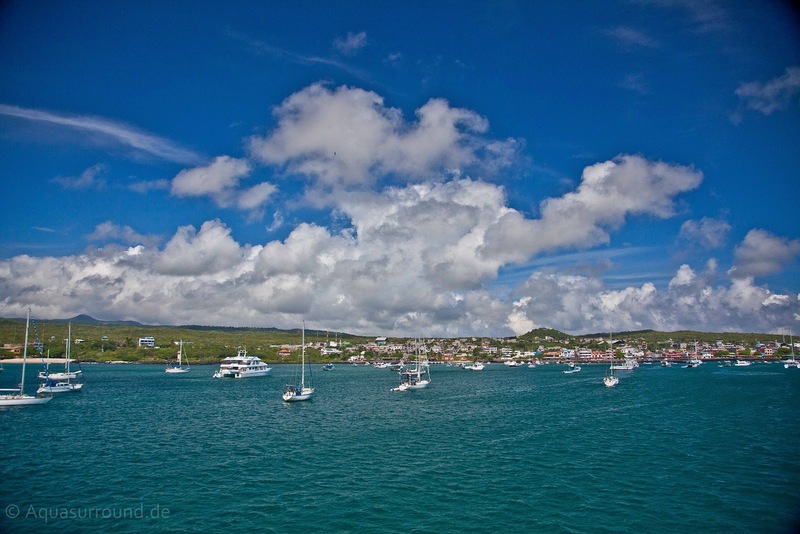 This is the administrative capital of the Galapagos Islands, with good shopping and dining opportunities. It is the location of one of the two Galapagos Island airports. There are so many truly remarkable things to do without ever leaving this island: exciting and enlightening hiking, surfing, cultural activities, visiting sea turtles, and going to the beach, just to name a few. 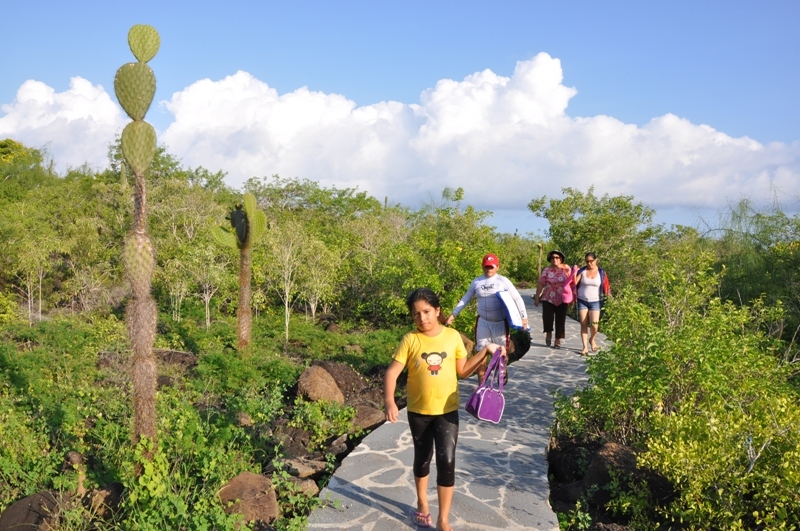 You will be immersed in the local culture, and see endemic birds, animals, plant and marine life. This article treats you some of the important and interesting visitor sites in and around Puerto Baquerizo Moreno before you even start to see the gorgeous sites that you can travel to by boat. Those are the subject of a separate article. On San Cristobal Island itself, you can visit everything from the National Park’s Interpretation Center and Charles Darwin Tortoise Reserve to Frigatebird Hill and Puerto Chino, the foremost surfing site in all of the Galapagos archipelago. The best of Ecuadorian cuisine is available and the artwork and designs of local artisans are available. Take a break from the snorkeling and hiking to take a stroll along the main street and enjoy the “big city” life. Whether you arrive on the main street by boat or from the airport you are going to be greeted as never before in your life. The harbor is surrounded by park benches and areas designed to sit and absorb the sounds and activities of this active harbor. The only problem is, you probably won’t find a seat! 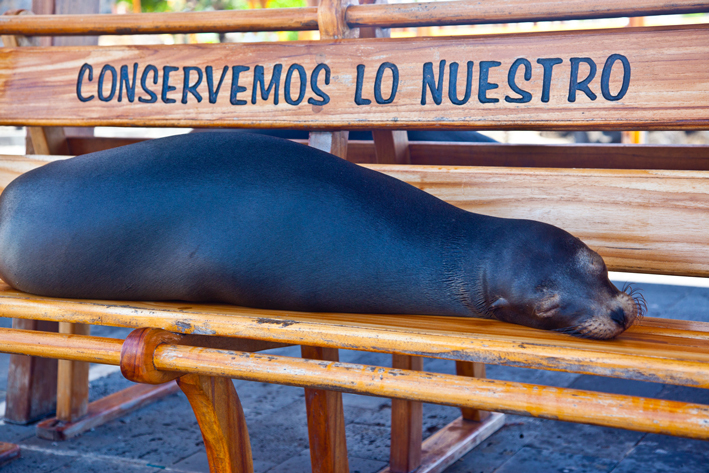 That’s not because there are so many people strolling on the promenade, but because our friendly sea lions think that the benches belong to them. Not only the benches, but the pier, the pangas and the boats are all populated by the sea lions. Believe me when I tell you that they are watching you every bit as much as you are engaging with them! 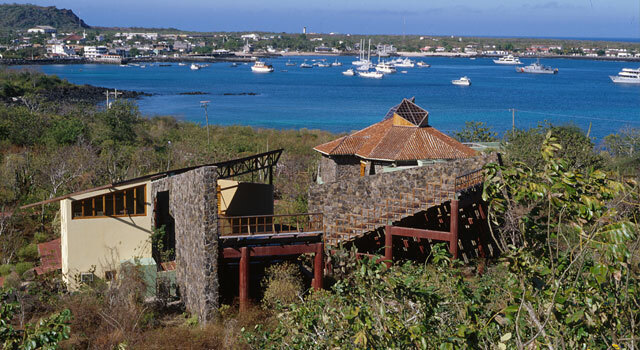 The Galapagos Navy also is housed at Puerto Baquerizo Moreno. Even from your cruise ship, if you are awake to see the sunrise in the early morning hours, you can hear the navy seamen chanting as they run across the Island doing their daily drills. 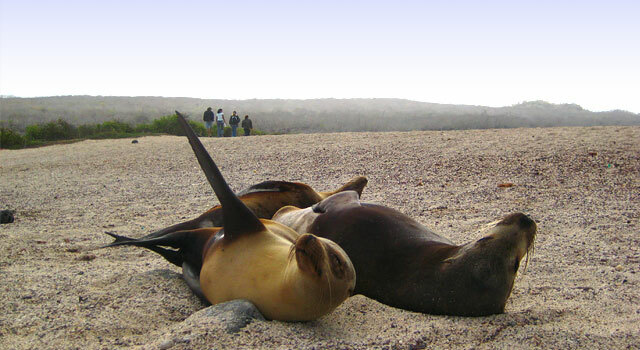 A pleasant and scenic walk from town is the home of a large sea lion colony and nursery. La Loberia at low tide is an unmitigated treat. It is thrilling to watch the mother bring her pups to the tide pools for swimming lessons. Feel free to jump in the water and snorkel while the pups cavort around you. Get up close and personal as they dive down below you and burst back up again with their little faces just inches from yours. They seem to smile, and you will be smiling too. While you are here, enjoy the bird watching, marine iguanas and, from time to time, giant tortoises. The Galapagos National Park has regulated that every cruise ship visitor must be introduced to one of three specific sites on the Galapagos Islands in order to acquire a sense of the history of the Islands and their importance to evolution and conservation. Two of these sites are on San Cristobal. 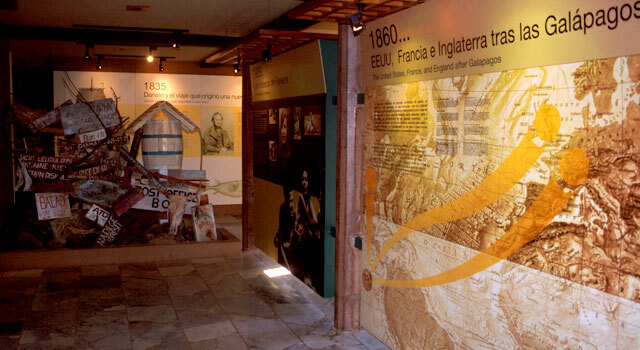 The first is the Interpretation Center. 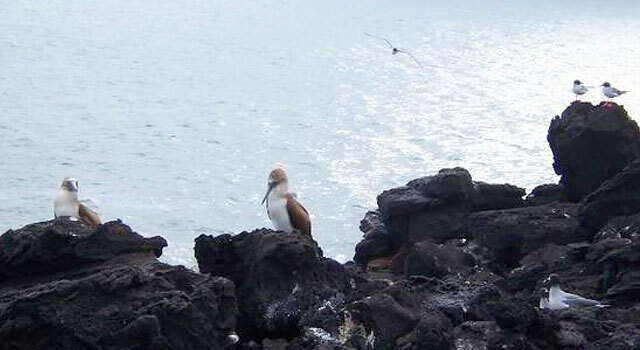 It is just about a 10-minute walk from the harbor and provides important background information and introductory perspective for any traveler to the Galapagos Islands. The exhibitions review the archipelago's natural volcanic history and formation, explain why certain wildlife has been able to sustain itself on a sometimes barren landscape with very little fresh water, and provide insight into the impact of humans and the importance of conservation on this delicate ecosystem. 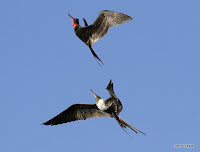 From the Interpretation Center, you may hike on the two-mile lava trail to Frigatebird Hill and Darwin Bay, where you will see the breeding area of both the Magnificent Frigatebird and Great Frigatebird. 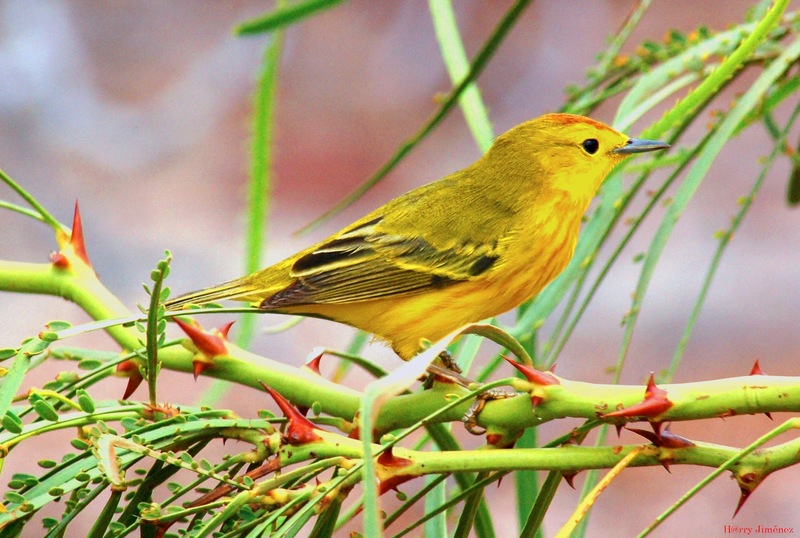 The local plant, animal and bird life provides you with many exciting photographic opportunities. You are likely to see a unique dry forest of cacti, acacia and sometimes Galapagos cotton. At Frigatebird Hill and Darwin Bay you will be treated to sweeping views of the port, and the northwestern part of San Cristobal, including Kicker Rock. The other “must see” visitor’s site is La Galapaguera. Together the Galapagos National Park Service and the Charles Darwin Research Center, have designed a remarkable preserve and controlled breeding center for the Tortugas, the purpose of which is to see that the once-dwindling population of indigenous Galapagos tortoises thrives again. You will observe these gentle reminders of the past and hope for the future wander through their environment searching for shade and leafy greens, as you photograph and preserve your own precious memories. It is possible to hike to the preserve where you will experience the giant tortoises in the preserve mirroring their natural habitat. Many of the species endemic to San Cristobal can be seen on this hike, including the giant tortoise, lava lizard, gecko, and mockingbird. Not far, and also located in the San Cristobal highlands, are El Junco and San Joaquin Hill. Laguna El Junco is a miraculous fresh water lake, the largest fresh water preserve in the entire Galapagos archipelago. It was formed in the middle of the Pacific Ocean in the crater of a now-extinct volcano in the highlands of San Cristobal. Because of the fresh water, the color and abundance of the flora and fauna are strikingly green in what is often a barren landscape. This is, indeed, some of the most dramatic greenery in the island system. It is also home to a large population of bird life. The hike to El Junco provides the opportunity to climb up the sides of this extinct volcano. From your spectacular vantage point you may see many of the endemic bird species including Galapagos mockingbirds, pintails, moorhens, pied-billed grebes and frigate birds swooping down to the water to fish. The view from the 2400 foot summit at San Joaquin Hill will take your breath away. While visiting the highlands you also will be treated to the remarkable view of San Cristobal Island's Eastern shore including Punta Pitt, Puerto Chino and El Pescador. Nothing on the Galapagos Islands compares to the surf at Puerto Chino. Just moments from the San Cristobal airport, it is a site not to be missed. This rocky reef is a surfer's paradise with consistent waves and a beautiful white sand crystalline beach. Swells are between 3 and 12 feet with a bottom reef of coral and sand. You can drive to this beach or take a nature hike over lava fields and dry forest habitat to this gorgeous locale where you are likely to see both blue footed boobies and frigate birds diving. I've given you here just a taste of the diversity and beauty available on the Island of San Cristobal, the place where I grew up and live. The greatest pleasure I have is when I get to share this paradise that I call my home. This is the very reason that I built and sustain the Galapagos Eco Lodge. I want visitors to San Cristobal to experience all of this beauty with me and become immersed in our Ecuadorian culture as well. From the Eco Lodge, I will be your guide to all of these spectacular visitor sites and so much more. For more information on the Galapagos Eco Lodge in San Cristobal, Galapagos Ecuador, visit the Galapagos Eco Lodge web site.